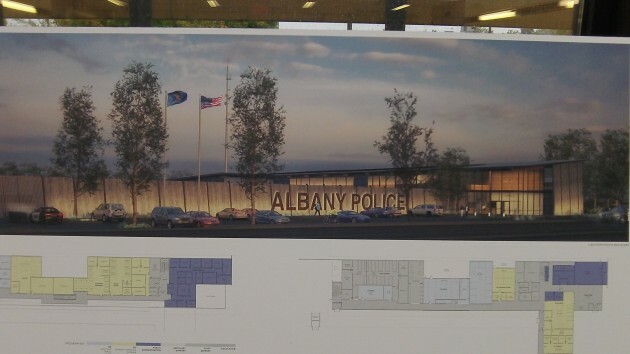 The combined costs of Albany’s proposed new police headquarters and main fire station would range from a low of $21.3 million to a high of $25.6 million, according to the preliminary designs and cost estimates presented by five companies. The firms presented their competing proposals to city officials earlier this month. Separate panels comprised of the fire and police chiefs and other officials are reviewing them in hopes of making recommendations to the city council in November. The council has talked about asking voters to approve a bond issue to pay for both projects in May 2015. The design concepts for a new police department, to be built on a vacant site off Pacific Boulevard S.W. alongside Cathey Creek, are still on display at the Albany Public Library’s main branch. You can take a look at them through Friday. Design concepts for the proposed fire Station 11 replacement downtown were on display in the same place earlier and were taken down to make way for the police designs. Anyone who wants to see either set of proposals or both after Friday may make an appointment with Staci Belcastro of Public Works, who has them in her cubicle at City Hall (Staci.belcastro@cityofalbany.net or 541-917-7645). The council asked for design proposals, complete with elevations, floor plans and cost estimates, at the suggestion of a special public safety building committee headed by former state Sen. Frank Morse and retired Linn County Sheriff Dave Burright. Along with the police and fire chiefs and others, Morse and Burright also are part of the panels reviewing what the architects and design firms proposed. 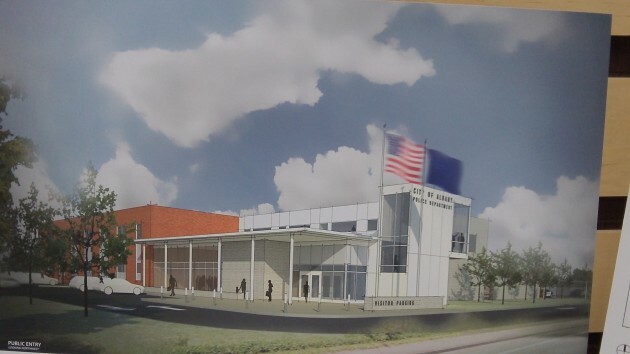 For the police headquarters, one of the firms, DLR Group, said its design would total about $15 million in constructions and “soft costs” such as permitting and various fees. Mackenzie’s proposal totaled nearly $13.9 million, and Skylab Architecture’s estimate for construction alone, minus soft costs, was $13.7 million. The proposals differ in size from under 42,000 to more than 44,000 square feet. All call for access from both Pacific in front and Willetta Street in back of the property. 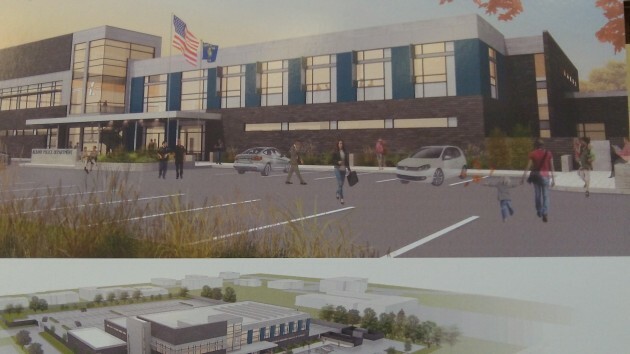 For the fire station, estimates including soft costs totaled $7.5 million from Peck Smiley Ettlin Architects, $7.9 million from Mackenzie, and $10.6 million from CB Two Architects. The proposed stations range from 22,000 to nearly 25,800 square feet. The Morse-Burright committee is hoping to recommend a new bond issue lower than the $20.3 million Albany voters rejected in 2012. The council and the rest of Albany’s downtown urban renewal board have decided to contribute $1.4 million toward the combined projects, and the council may also want to chip in some of what’s left of the city’s Pepsi settlement. The police department as envisioned by the Mackenzie firm. Skylab Architecture and others proposed a police station with a solar roof. This is the concept of the police building proposed by DLR Group. My hope: submit two separate bond measures to voters – one for police; one for fire. Let the need for each building stand on its own merits. Packaging them together in a bond measure that exceeds $20.3M will probably result in a second failure. I just received my property tax bill and I’m not in a good mood. I am curious about what will happen with the current police station if a new one is built at the south Pacific Blvd. location. I think it should be retained as a precinct station type facility, given its central location and proximity to the jail. I realize there may be too much common sense in that idea to be considered. I still think south Pacific Blvd. is a very poor location for Albany’s only police facility. It is not central to the jurisdiction they serve. Seeing the pictures of the proposed new police station at the library I admit raised my hackles. The City seems pretty sure of itself to proceed with planning before voters approve funding. Thank you for clarifying that. I didn’t know. It did put the council between a rock and a hard place as to how to proceed (if at all! ).